When thinking of Cyrano de Bergerac (1619-1655), most people will automatically bring to mind Edmond Rostand's play by that name. The play is about a poetic swordsman with a prominent nose, a fictional character, a burlesque of the actual man. Other Worlds: Journey to the Moon was written by the historical Cyrano, not the stage character. The Cyrano who wrote this science fiction epic was one of the most gifted poets of his generation. To quote the translator, "His book is a poem from an age when poetry, physics, metaphysics, and astronomy could all still exist side by side in one book, albeit a fantastic one." Cyrano was, indeed, a brave soldier who was wounded in battle twice, and he was an excellent swordsman. But, most important, he left behind a work that influenced many writers who followed. Cyrano was an satirist, a man ahead of his time who dared to challenge the orthodoxies of both contemporary astronomy and the Church. The translator, Geoffrey Strachan, has translated eight novels of international best selling author Andre� Makine, as well as over twenty other books from French and German. He won the Scott Moncrieff Prize for his translation of Makine's Le Testament Fran�ais. Mr. Strachan has used the Foolscap Press edition as an opportunity to revise and update his original 1965 Oxford University Press translation. In his informative introduction he speaks of "pataphysics," a term used by Alfred Jarry meaning the science of imaginary solutions. Mr. Strachan states, "If ever there was a classic example of pataphysics in action it is surely Cyrano's decision to resolve his contemporaries' disputes about the nature of the moon by penning an imaginary flight therein order, as it were, to see for himself: a perfect marriage between empirical method and poetic imagination." 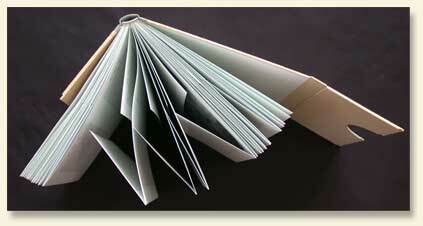 The artist Leslie Lerner is widely represented in the United States. In a review of his show at Miller/Geisler Gallery in New York City (January, 2004), Mario Naves in The New York Observer states, "His pictures of distant horizons and milky skies suggest an apocalypse over and done with; his charcoal drawings of similar vistas are suffused with a dry romanticism; his scrabbly, nightmarish paintings on Mylar channel Goya and Guston. . ."
The match between Leslie Lerner and Cyrano de Bergerac couldn't have been more significant. The artist has been immersed in a continuing theme, "My Life in France: The Suburban Headshop," his series of paintings depicting Mr. Lerner's own "other worlds." As he began work to complement this edition, Leslie Lerner saw that, "[These images] . . . would interact with the narrative images, creating a hybrid space. That hybrid space would serve as a parallel dislocation matching the quirkiness of the de Bergerac text." And, indeed, they do. The artist has created eight direct-gravure etchings for Other Worlds: Journey to the Moon. Mr. Lerner provides for us, in images, as thought-provoking an experience as Cyrano de Bergerac provides in words. The Foolscap Press edition of Other Worlds: Journey to the Moon is printed letterpress on Hahnem�hle Bugra. The direct-gravure etchings are printed on 300 gram Pescia. In this unusual binding "half pages" are opened revealing an etching in nearly every section of the book. 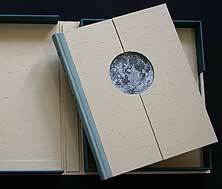 The book measures 9 x 11 1/4 inches, bound in quarter goat skin leather and is housed in a custom made box. 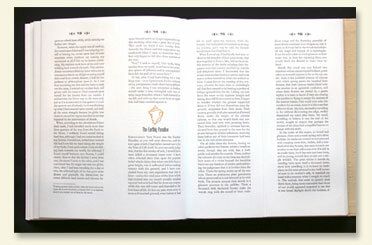 The edition is limited to 120 numbered copies plus eight printer's proofs numbered i-viii. The price is $2300. There are sixteen copies accompanied by an extra print that Leslie Lerner has hand colored. Click here to view the colored prints. The price for a hand-colored print and book is $3000. 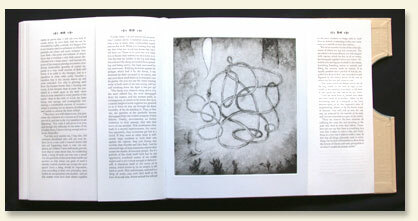 The book is signed in the colophon by both the translator and artist. Orders may be placed by telephone, email or letter. Please include $15 for shipping. State sales tax applies to California residents. Book dealer, institutional and Standing Order discounts are applied.